First Ladies of Disco Show is inspired by author/speaker/host James Arena’s tribute book “First Ladies of Disco: 32 Stars Discuss the Era and Their Singing Careers,” a best seller in the United States, Canada and Europe. Martha Wash is a two-time Grammy Nominee, known for her distinctive and powerful dramatic soprano voice. Ms. Wash has been dubbed “The Queen of Clubland” due to her ongoing success in the dance music genre. Martha’s fame would have made her mentor, the late disco pioneer Sylvester, proud. 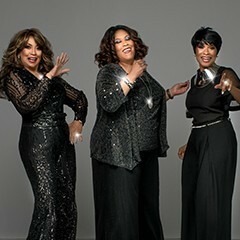 As a member of The Weather Girls (previously known as Two Tons of Fun), Wash achieved tremendous success with the immortal “It’s Raining Men,” one of dance music’s all-time greatest hits. Wash also performed lead vocals on Black Box’s chart-toppers “Strike It Up” and “Everybody Everybody,” as well as C+C Music Factory’s “Gonna Make You Sweat (Everybody Dance Now),” which hit No. 1 on the Billboard Hot 100. After 10 years, Martha recently returned to the Billboard Dance Charts with her hit single “I’m Not Coming Down,” which reached the #2 spot topping Cher, Jennifer Lopez and Lady Gaga. Linda Clifford, a five-time Grammy Nominee, scored numerous hits from the 1970s through the 1980s, most notably “If My Friends Could See Me Now” and “Runaway Love,” the latter considered a landmark innovation in rap history. In 1980, she released a duet album with R&B legend Curtis Mayfield, The Right Combination. She recorded the popular “Shoot Your Best Shot,” produced by Isaac Hayes, and the song “Red Light” for the soundtrack of the smash hit movie Fame. Both songs reached #1 on the American dance chart and enjoyed pop crossover success.